Biodegradable polymers, as defined in this report, are bio-based or synthetic polymers that undergo microbial decomposition to carbon dioxide and water in industrial or municipal compost facilities. A few of these polymers decompose in backyard compost bins or in soil, freshwater, or saltwater. Major biodegradable polymers include polyhydroxyalkanoates (PHAs), including polyhydroxybutyrate (PHB) and related copolymers; polylactic acid (PLA); regenerated cellulose; starch compounds (thermoplastic starch); copolyesters such as polybutylene adipate terephthalate (PBAT) and polybutylene succinate adipate (PBSA); polybutylene succinate (PBS); polycaprolactone (PCL); and polyglycolic acid (PGA). 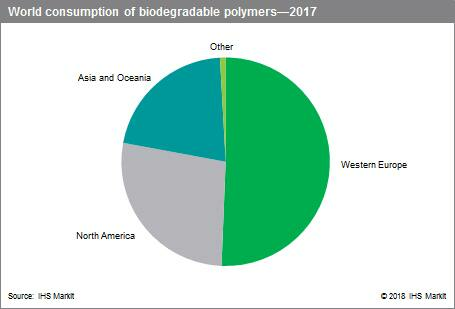 Western Europe remains the largest producer and consumer of biodegradable polymers. Legislation is a key market driver and includes plastic bag bans in Italy and France, a packaging waste directive with recovery and recycling targets, and other collection and waste disposal laws that aim to avoid landfill. Western European landfill disposal costs (landfill gate fees plus landfill taxes) are substantially higher than those in Central and Eastern Europe and North America, and compost infrastructure is comparatively well developed. Consumer awareness of sustainable plastic solutions and government interest in the reduction of greenhouse gas emissions and fossil fuel independence also contribute to market growth. Asia and Oceania—the second-largest consuming region—relies on imports as well as local production to satisfy demand for biodegradable polymers. Production capacity in China and (to a lesser extent) Thailand has increased substantially in recent years; production and consumption have increased as well but at a somewhat slower rate. North America is the second-largest producer of biodegradable polymers and a net exporter of polylactic acid. Regional demand drivers include the expansion of composting programs and infrastructure at the local level. 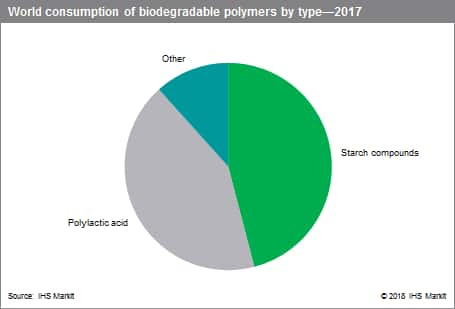 In 2017, starch compounds and polylactic acid (PLA) accounted for 46% and 42%, respectively, of total biodegradable polymers consumption. Other important biodegradable polymers include copolyesters such as polybutylene adipate terephthalate (PBAT) and polybutylene succinate adipate (PBSA); polybutylene succinate; polycaprolactone (PCL); cellulose derivatives; polyglycolic acid (PGA); and polyhydroxyalkanoates (PHAs), including polyhydroxybutyrate (PHB) and related polymers. 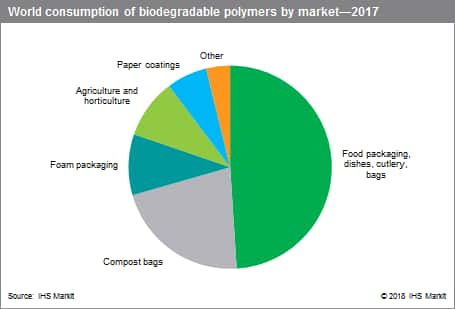 In terms of biodegradable polymer markets, the food packaging, dishes, cutlery, and bags market is the largest end-use segment, as well as the major growth driver. This segment will benefit from plastic bag restrictions. Double-digit growth is expected in the next several years.